This is a post that I’ve been meaning to write for some time, but it took some research and the kids’ heading to school (YIPPPPPPPEEEEEEEEE!!!!) for me to sit down and write it. Here we go! When I first became interested in decorating about 10 years ago, I didn’t have any experience with broadloom carpet beyond the wall-to-wall super plush (but easily crushed) beige nylon varieties I saw at Home Depot (and can also be found in our barn room) or the super thin, mustard gold iterations I found in basements. And that’s what you find in so many carpet and home showrooms, right? A thousand varieties of beige and gray, thick pile … not inspiring, just functional, right? So why am I so excited about carpet? Vincente Wolf. This carpet is SO NOT beige. Because broadloom carpet can be very beautiful and a wonderful option, especially in some scenarios I’ll detail further on. But first let’s get down to what the weft … I mean “heck” … a broadloom carpet is. Woven broadloom carpets fall into 3 categories: axminster, wilton, and velvet. Worker making carpet at a Jacquard Loom, via Wired. The first power loom with a Jacquard mechanism was developed in 1849. Axminster: Axminster carpet is produced on a jacquard loom, with each piece of pile yarn individually woven into place and cut into tufts and then held in place by the weft. These carpets can therefore having an infinite scope of pattern and colors. Axminster carpet construction, via Bloomsburg Carpet. Antique Axminster rug via Nazmiyal Antique Rugs. Wilton: Wilton weave carpets are also manufactured on a jacquard loom but with a very different weave structure. In fact, in a wilton carpet, every yarn is kept in continuous strand — never cut or tufted — and is woven all the way through. Wilton weave carpet construction, via Bloomsburg Carpet. Wilton carpet designs are created by inserting wires in the pile warps of the carpet and extracting the yarns wanted for the pattern when needed. Because the yarn is buried on the back when not needed, wilton carpets are incredibly tightly constructed, dense, and durable. They are considered to be the premier woven carpet. Wilton carpets are capable of ‘all cut’, ‘all loop’ or a combination of the two, as below. Prestige Mills Deerfield via the Carpet Workroom. Velvet: Velvet looms create pile by looping yarn over the wires and cutting the loop as the wires are removed to produce a soft, short, and dense pile. A loop velvet weave creates a high and low texture on the weave for a variety of patterns. Velvet carpet construction, via Bloomsburg Carpet. Because it is so dense, it can be great for high traffic areas. However, due to its uniform surface, it can also show indentations and tracks (not permanent!). The most popular kind of carpet since the 1950s is tufted carpet. It all began when young Catherine Evans Whitener from Dalton, GA decided to try an copy a quilt she had seen using cotton yarns, a running stitch, and white muslin. She thus unwittingly created what is now an American classic — chenille tufted bedspreads. Little did she know what else was down the road…. By the 1930s, creation of tufted chenille bedspreads had become mechanized, and it was only a hop, skip, and a jump to mechanize tufted carpets. Even today, Dalton, Georgia produces 70% of the world’s tufted carpets. Tufted carpet construction, via Discount Carpet Warehouse. 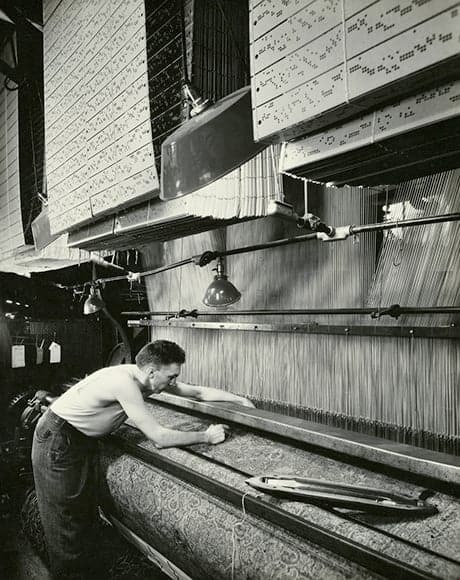 In tufted carpets, clusters of yarn fibers are punched through a material by a needle and held in place by adhesive latex and the secondary backing. Tufted carpet is the most economical of the carpet producing methods and extremely fast. One roll of axminster might take 8 hours to make whereas one roll of tufted takes approximately 1 hour. Wool and 3 synthetics — nylon, polyester, and Olefin (polypropylene)— are the most popular fibers used in broadloom carpeting. Wool is the most expensive fiber but is naturally stain resistant and durable. Nylon is super popular due to its durability and relatively lower cost. You’ll probably start hating your carpet before it wears out. Polyester has a wool-like appearance and is soft underfoot but is less durable. Olefin is glossy and one of the least expensive fibers. Also less durable. The quality of your fiber — whichever kind it is — is the best indicator of its ability to wishstand wear and tear. I’m not much of a wall-to-wall carpet girl. I usually prefer wood floors with a rug on top. That being said, there are a lot of areas where wall-to-wall can be really lovely — bedrooms and play rooms in particular. I love using broadloom carpet in 2, non-wall-to-wall applications. Firstly, broadloom carpet can be amazing as a stair runner, especially if your stairs are too wide to use a typical 27″ roll runner. I used a lovely cream and coral wilton weave as a stair runner in my first One Room Challenge — my Artfully Fresh Foyer. The beauty of broadloom as a stair runner is that you can customize the width so that you can have 3-4″ of wood showing, but not more than 6-8″ depending on how wide your stairs are. For instance, if you have a very wide staircase, you can have proportionally a little more wood showing than on a narrower stair. Yikes! We’re going to have to hop down these stairs on one leg. Another scenario in which broadloom carpet comes in handy is when you have a very large and/or oddly shaped room. Most carpets come in widths of 12-13′ (size of the looms) and are priced by the square foot or square yard. Wider widths can be created by seaming with another piece. Have a 25′ x 25′ room? Buy a broadloom carpet and bind or serge the ends for an area rug. Have a huge fireplace hearth sticking out into the middle of it or an angled or curved wall? Your fabricator can create a custom, bound cut-out. Using broadloom as a bound rug for a room of any size can potentially be a money saver, too, if, for example, you are dying for a wool rug in your living room but that 9′ x 12′ hand-knotted piece is out of your budget. A 9′ x 12′ wool broadloom, while it ain’t cheap, may be $1-2K less than a hand-made rug. Kelly Rogers Interiors. Could you imagine that carpet could come in these colors?! 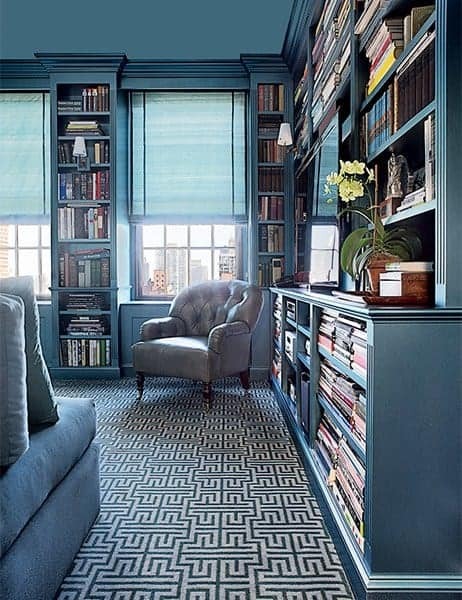 In the above small library, I mixed a traditional Oriental rug in one conversational area with a Bellbridge Boxwood bound carpet in the other. For a color/pattern lover like me, finding really great broadloom carpet to use as an area rug can sometimes be difficult. The market is really saturated with solid neutrals, sometimes spiced up here and there with a trellis pattern. That being said, there is some hope. Stark’s omnipresent Antelope pattern has reignited the desire for interesting patterned carpet. 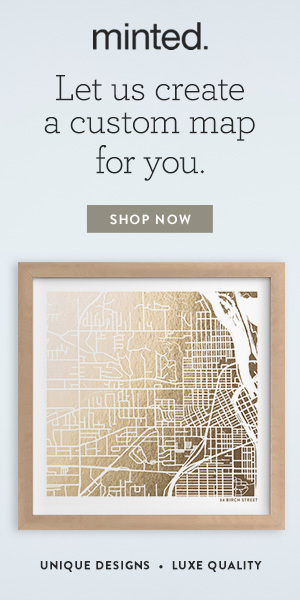 So much so that Masland, Karastan, Prestige Mills, Silver Creek, Glen Eden, and even Ballard Designs (in an area rug for the last) have all created their own iterations! When I’m looking for carpet, I try to go for the highest quality makers out there. I also nearly always gravitate toward wool. Why? The FEEL — nothing feels as soft and as good as wool. Stain resistance — the lanolins present in wools have a natural stain resistance. Durability — wool wears well and is naturally springy, therefore holding its shape well long term. That being said, wool is also the most expensive fiber. There are a few wool/nylon blends that I’d be will to try — like 80% wool 20% nylon combos — if they were necessary to fit the budget. Some of my favorite broadloom carpet companies below. Except for Stark and PFM, I think you can source most of these through various high-end carpet and rug stores, like one of my local resources PRG Rugs in Nashua, NH. Tell Fouad I sent you! Stark & Patterson Flynn Martin: $$$ Great sources. These companies also seem to “curate” weaves from other sources, like Prestige Milles and Momeni (see below). Design trade only. Available to Home Glow clients. Prestige Mills: $$$ So many favorites I don’t know where to begin. I’m dying to use some of the Missoni patterns. Bellbridge: $$$ Really awesome patterns, beautiful quality. So many I love that it’s hard to choose, but I particularly like the Soho II, Linen, Loft, and Cottage Collections. Momeni: $$ Smaller, older company with some really interesting patterns. LOVE the Highlands pattern for an area rug. The Zig Zag and Diamonds collections are well-priced. Bloomsberg/Silver Creek: $$ Ginger, Skipper, and Zia are all fun. Fibreworks: $-$$ My go-to for natural fiber broadloom like seagrass, jute, and sisal. Neutral wool options at very reasonable prices. Here’s a Pinnable graphic to remember me by! Do you have any uses for broadloom carpet? Any questions?